Shucks … I was hoping he was out for the year. The Bengals need to do full face lift. Not just a nose job in Taylor. Move on from Dalton. We’ve seen Daltons best and while it wasn’t terrible we need more than “ Trent Dilferish” less a Super Bowl performance. Trade for Wilson or draft Lock or Haskins. Not terrible??? What are you smoking he’s had 3 seasons where he’s thrown at least 16 INTs and was on track to throw 16 last year, he’s only thrown 30 TDs or more in a season once, has only thrown for more than 4,000 yards twice. At least he should be healthy enough to lead the Bengals to a 4-12 record and a legit shot at the top 3 QBs in 2020. Yes, Andy Dalton was not terrible from 2011-2015. I dont if care they never won a playoff game. He was the QB on a team that made the playoffs 5 years in a row and thats not terrible. No one is saying he is Aaron Rodgers. There are a lot more than simply TD-Interception ratios to look at for a QB. Was he prone to picks? Sure. The analytics at PFF had him graded as above average for all those years except 2014, and even had him at the #12 QB last season. The analytics are more telling than the counting stats. Again no one is saying the dude was elite. But was he terrible at his best, no. You really dont know what terrible means. All those guys had a better season. I agree. Without a supporting cast even Brady looks only adequate. I don’t smoke … but thanks … there’s not many QBs I wouldn’t take over Dalton. Only a few … I get what your saying but he did help lead them to the playoffs severs times. That’s what I mean by not terrible. 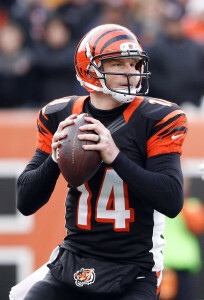 There are worse … ( Tannehill, Marriota , ) … just saying If we are going to hit the reset button … then let’s do it full force … The Bengals have some playmakers on offense if the line is in order … I would rather see a change at QB than the same old Red Rifle.